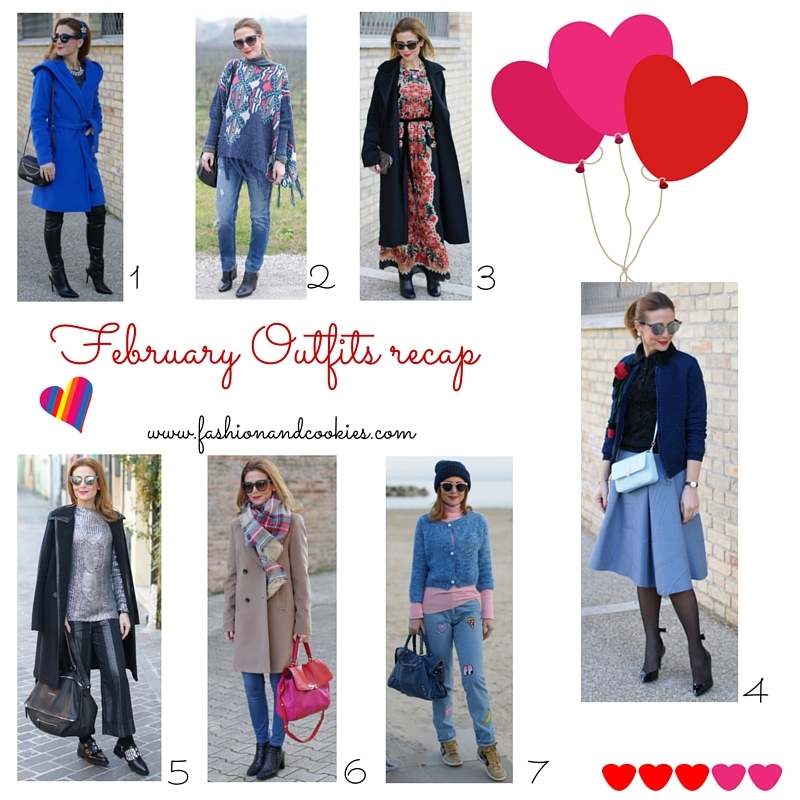 Waiting for your feedback: what is your favorite outfit from February ? Many people believe a leap year might be unlucky. All I know is the days are slowly starting to last for longer, and I love that. I can't wait for Spring and even tho this winter hasn't been really cold, I have to say the weather has been really too changeable and unpredictable and, in my region, way too humid (my hair and fashion blogger bones do not say thank you !). I have been wearing more pastel colors, also I started wearing smaller bags more often - the crossbody ones are perfect for a nice walk. I enjoyed high heels as always, but also mid heels and sneakers. I am now looking forward to what March will bring us - my plans are training more both at the gym and at home and seeing my friends more, as well as a lot of new projects for the blog ! Hope February has been treating you well and, as always, I can't wait to get your feedback about your favorite look from this month ! Kisses ! In attesa del vostro feedback: qual è il vostro outfit preferito di febbraio ? Molti credono che un anno bisestile possa essere sfortunato. Ciò che so io è che le giornate si stanno lentamente allungando, e mi fa un immenso piacere. Non vedo l'ora che arrivi la primavera, sebbene questo inverno non sia stato davvero freddo, ma il meteo è stato troppo mutevole e imprevedibile e, dalle mie parti, troppo umido (i miei capelli e le mie ossa da fashion blogger non ringraziano di certo !). Ho iniziato a indossare più colori pastello, a portare borse di dimensioni più ridotte - quelle a tracolla sono perfette per una passeggiata. Ho portato tacchi alti come sempre, ma anche tacchi medi e sneakers. Ora non vedo l'ora di scoprire cosa ci riserverà marzo - i miei piani prevedono più allenamenti in palestra e a casa e anche vedere di più gli amici, oltre a una serie di progetti per il blog ! Spero che febbraio vi abbia trattati bene e, come sempre, attendo il vostro feedback sul vostro look preferito del mese ! Baci ! This is an original post from Fashion and Cookies fashion blog. Reproduction without written authorization of the author is not permitted.